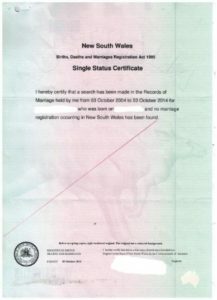 If you are planning on getting married to your Australian significant other, you will need to provide a single status document as proof of your single status. If your document is non-English, chances are you need to have it translated since Australian authorities require you to have your documents in English. If you are looking for a single status translation services provider, let us know, and we’d be happy to help you with your needs. Sydney Translations has become one of the leading translation services providers not only in Sydney but also in the whole of Australia. So what are you waiting for? Request for a free quote today using the translation form. Your firm quote will be sent to your email in less than 15 minutes. If you require a translation in Sydney, you need to know that most authorities will require you to submit a NAATI certified single status certificate translation. Since NAATI maintains the high standards and certifies translators and interpreters in the translation and interpreting industry, authorities ask for NAATI translations. As such, before you look for a translator in Sydney, ask for the requirements of the authority you’re submitting your document to. If you need a NAATI single status certificate translation, we’ll be more than happy to provide you with our services. Sydney Translations has NAATI certified translators who have years of experience in the translation industry. For each type of document and language, we have handpicked translators who are highly skilled and great at what they do. If you are in need of NAATI translators, we have hundreds. Once we receive your translation order, we allocate it to one of our project managers who will handle your translation. Our project manager will give your order to the most qualified translator and will check your completed translation for any errors and inaccuracies. Once you receive your single status certificate translation, you are confident that it is high quality and accurate. No matter what your deadline, we can accommodate you. If you have an urgent translation job, you can take advantage of our express single status certificate translation services. You won’t be disappointed. Here at Sydney Translations, we believe that translations should be affordable for everybody. Our translations start at a mere $69 per document. Your document’s exact translation quote will depend on your deadline, language and length. Get a free quote in 15 minutes by uploading a scan or photo of your document using our free quote form located on this page. If you have a question, chat with us via our website’s Live Chat feature. One of our customer support representatives will reply in no more than a few minutes. We provide two types of single status certificate translation services. If you are in a hurry, we can translate your documents fast. Standard single status certificate translation services – This is our standard service where your translation is completed in just 2 to 3 working days. Express single status certificate translation services – On the other hand, we have a faster translation service where you can receive your translation in less than 24 hours! Take advantage of this feature if you are in a hurry. Yes, if you require a NAATI certified single status certificate translation, we have NAATI translators who will certify your translations. Yes. We have an efficient online ordering process where you can order one of our single status certificate translation services. There’s no need for you to come to our office. We believe that your time should be well-spent with what’s important. Our translation process even allows you to not only order but also to receive a translation online. Yes, we do. We can send you hard copies of your single status certificate translation via Australian post. Do allow an additional 3 to 5 days for your hard copy to reach your preferred address. We have hundreds of translators who are native speakers of their languages and fluent in their secondary languages. Here is the list of the languages that we mostly translate from. For translation of single status certificate into English, the majority of 1 page single status certificate are deemed as ‘standard documents’ and are priced at a flat rate per document of $69.00 per page. Are you interested in ordering our single status certificate translation? Follow this step by step procedure on how to order. Using the translation form, upload a copy of your document. A scan or photo will suffice. In 15 minutes, you will receive the exact quote for your translation order. If you are satisfied with our quote, process your payment via credit card or bank transfer. Once your translation is finished, you will receive a draft of the translation for you to check and review. Let us know if the draft is satisfactory and we will email you the final soft copy of your translation. Get a free quote today to start your translation order. Simply complete the translation form and receive an exact quote in just 15 minutes!